so the money thing… it’s not just a rumour?? 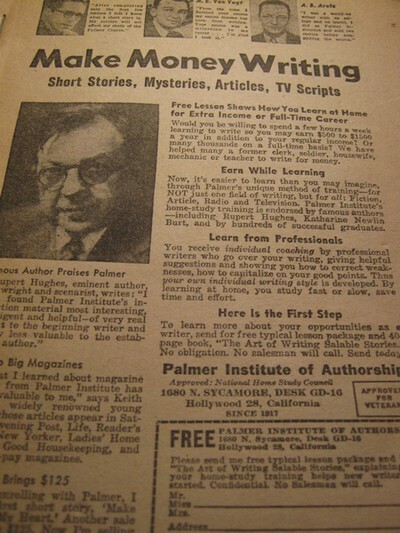 Advertisement for the Palmer Institute of Authorship, from which a “free typical lesson package and book: The Art of Writing Salable Stories”, can be requested by mailing coupon to: 1680 N. Sycamore, Desk GD-16, Hollywood, CA. Had the Palmer folks been really smart or, better yet, prescient, they’d have asked for a few words from a young Raymond Carver who was among those that sent away for the package— and also came to know what a short story is. More or less. There was a time when all F. Scott Fitzgerald had to do was knock off a quick short story, send it to the New Yorker or Esquire and they would wire $1000 to the American Express in Paris for him to pick up, which kept him and Zelda in champers and escargots for who knows how long. I also remember reading in the introduction to Welcome To The Monkey House (Kurt Vonnegut’s short story collection) that the stories were written when he found himself in need of some cash. Now it’s us paying entry fees to writing competitions that we have no hope in winning. But I do love your post. Reminds me of those learning to draw ads, which in turn reminds me of a terrific story by J. D. Salinger called De Daumier-Smith’s Blue Period, about a young artist who moves to Montreal to become an instructor for a correspondence art course. I sometimes think I was born a generation too late. You’ve conjured up some great images, not the least of which is champers and snails. It’s in his famous 9 Stories collection.